The commentary accompanying this picture usually goes along the lines of: "Hey, look at these Korean Americans! They protecting their own with guns! I bet their stores were not looted at all! Londoners should be able to do the same!" As everyone in the newsroom debated the use of force – whether to use rubber bullets, tear gas, water cannons, Tasers, even bean-bag guns – I wondered why they were wasting their breath. “If your cops had guns, day number 2, 3, 4 and 5 of this, it would NOT have happened!” I said at a recent meeting. Funny, because the Korean does not find the picture to be inspiring at all -- he finds it dispiriting. The Korean has been a consistent advocate of very strict gun control, partly because he knows what happened to Korean Americans during the riot. 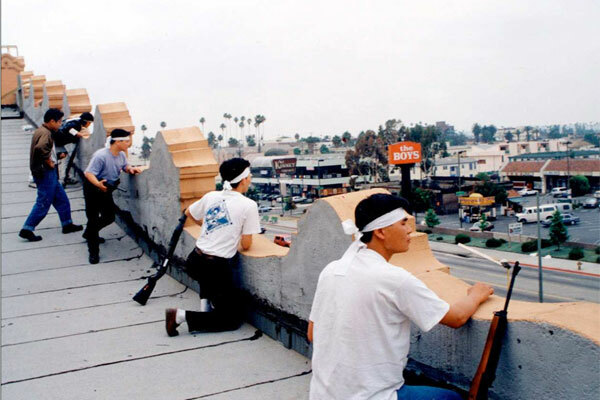 Although Korean Americans constituted only 2.5 percent of Los Angeles residents as of 2000, Korean Americans suffered the estimated property damages of over $350 million, or approximately half of the riot's total property damage. So much for the idea that guns will stop property damage. To an American visiting London, one of the more striking aspects of last week’s riots was how few people died. Not including the police shooting death that touched off the original disturbance, five deaths have been attributed to the riots and looting. By contrast, 53 people died in the rioting that followed the acquittal of police officers in the beating of Rodney King in Los Angeles in 1992. At least part, if not most, of the difference is down to the fact that Americans are armed to the teeth: the criminals, the cops and the shopkeepers all have guns, whereas Britain has one of the lowest rates of gun ownership in the world. The result is a low homicide rate: just 2 per 100,000 inhabitants in 2002, compared with 5.62 in America. Murders in Britain are much less likely to be committed with a gun. Its firearm murder rate, at 0.02 per 100,000, is a fraction of America’s, at 3.25. Three of the riots’ victims were run down by a car while guarding a petrol station and one died of injuries after being beaten. The fifth was a looter who is believed to have been shot by another looter. Britons are not more law-abiding than Americans. Their rates of car theft, robbery and burglary are all higher, some substantially. But strict gun-control laws and borders that are more impervious to smuggling than, say, America's border with Canada, mean that guns are less likely to be used in crimes. That may also cut down on firefights: British police generally do not carry guns, in part because they worry less about being shot at. Numbers in the LA riot bears out this point. 32 out of the 53 dead in the LA riot were killed by getting shot. Take a look at this list detailing the manner of death for each dead person during the LA riot, and how guns were involved for those who were shot dead. And then ask yourself how many of those deaths would have still happened if no one but the police had guns. If you'd like, replace guns in the hands of the looters with knives, and think about how effective at killing a drive-by stabbing would be compared to a drive-by shooting, or if the police would be quicker to shoot someone who is pulling a knife out of his pocket instead of a gun. Guns do not stop riots. Social order, established through law, ethics, morality and collective identity, does. For a recent example, the way the Japanese people handled themselves after the catastrophic earthquake clearly shows that even under conditions that are eminently ripe for indiscriminate looting, civilized societies find a way to maintain order without degenerating to the level of naked brute force. (By the way, don't think this happened because the Japanese people are angels. In 1923, in the aftermath of a massive earthquake, there was a riot that ended up killing as many as 6,600 ethnic Koreans who were living in Japan.) Even in the U.S., indiscriminate looting could have broken out in the massive blackout in 2003 that left 55 million across the northeastern United States and Canada without electricity. Despite the widespread concern over looting, actual incidences of looting were few and very far between. And as any New Yorker who went through the blackout can attest, it was not the guns that prevented the looting that everyone feared. In response to this post, the Korean predicts that there will be a lot of outraged gun advocates on the comment board -- over the years, the Korean found that the only rivals of gun advocates in terms of zealotry are anti-dog meat people and fan death deniers. The Korean welcomes them, as he welcomes all comers as long as they keep up with the Comments Policy. (For the record: The Korean respects the Second Amendment. But just like the freedoms guaranteed in other parts of the Bill of Rights are not unlimited, he believes that there should be sensible regulations on firearms, such as license and registration, and steep penalties for illegal sales.) But the Korean will conclude by addressing one of the common rejoinders, because he is yet to see it forcefully rejected in the public discourse about this issue. Gun advocates frequently argue: "Who cares if the looters get killed? They are looters! They deserve it, and we have a right to defend ourselves!" The lack of civilized mindset in this statement is astounding. The looters deserve prison time and payment of restitution. But they plainly do not deserve to die. It is one of the most fundamental principles of justice that the punishment should be proportionate to the crime. We don't cut off the hands of the thieves, and we don't break every part of the body of a murderer on a breaking wheel, because such punishments are deemed wildly disproportionate to the crimes in a civilized society. Our nation's constitution, in the Bill of Rights, guarantees that punishment will be proportionate to the crime. Our nation's law clearly states that people who commit certain types of crime under certain circumstances deserve to die, and looting is not one of those crimes. The law is also clear that self-defense should be proportional to the perceived threat. Deadly force can only be used against a deadly threat -- unless the looter also looks like he is trying to kill you, you cannot try to kill the looter either. Not even the police is allowed to brutalize a suspect, even though the suspect might be clearly in the middle of committing a crime. That is the law, and that is also justice. The idea that we should be allowed to kill whoever remotely threatens us is repugnant to law and order. When people say they want to be able to shoot down the looters, what they really want is not law and order. What they truly want is anarchy, a war of all against all, and the biggest guns with which to survive that war. > Although Korean Americans constituted only 2.5 percent of Los Angeles residents as of 2000, Korean Americans suffered the estimated damages of over $350 million, approximately the half of the riot's total damage. So much for the idea that guns will stop property damage. Um gwern, I'm pretty sure that TK's point is that despite the fact that the Korean American shop owners were armed during the 1992 riots, they still suffered the bulk of the property damage during that civil disturbance. More poignantly, firearm protection can only do so much against so many looters, arsonists, etc. So basically, baring arms is not a guarantee that no threat will come against the group that is armed. Nah, the reason Koreans suffered so greatly was due to the shooting of a little black girl by a Korean shop owner that infuriated the black population. Had the Korean Americans not defended their property, likely there would have been significantly more damage. Before we jump on the lady for having a gun in her shop, bear in mind the amount of robberies that happened in Korean shops back then. As for her shooting a young girl, she deserves punishment of the highest degree. Try harder. You're a smart guy. You will get it. Perhaps the photo is inspiring in the historical context. The police and the government, who are supposed to protect citizens with law and order, abandoned Koreatown during the riots despite pleas for help. People are not supposed to take the law into their own hands unless the circumstances are dire, and clearly they were, and clearly the law abandoned these people. To me I consider it to be less about the guns and more about the unity and community - people banding together in times of need. The breakdown in government and law enforcement ineptitude allowed anarchy to run rampant, so ultimately the blood spilled is equally on the hands of the government and the rioters. The only difference in the eyes of the law is the divide between willful actions and negligence. > Try harder. You're a smart guy. You will get it. I still don't. The only obvious interpretation is some sort of counterfactual comparison with the Afro-Caribbean riots in England, which differ in many salient ways, of which gun availability is only one. What am I comparing against, a scenario in which the Korean-Americans didn't have guns? Well, I don't see how that would help them in the least. A scenario in which neither the blacks nor Korean-Americans had guns? But as Michael R points out (and every account I've read agrees), the police didn't stay out because they were afraid of blacks with guns! There's no reason to believe both sides being disarmed would make any major difference to the property damage (guns don't kill stores, fire & looting kill stores). So I don't see how that would help either. A scenario in which only the Korean-Americans had guns? Well, I guess that'd work out better for them but it doesn't seem to be what you are getting at. I am always in the opinion that availability of firearms erodes the trust between the public and the law enforcement not to mention the level of civility amongst the public as well. I think the level of gun availability is immaterial to the likelihood of civil unrest occurrences. Riots in LA, Athens, and London, even the candlelight protest in Seoul few years ago have much greater underlying factors that ignited and accelerated the public discontent. It’s only that in the case of LA riot (or even during the aftermath of Katrina), the police were unable to exert the control of the situation beyond containing it due to the level of firearm availability. Otherwise, the government can declare martial law and apply shoot-first-ask-questions-later principle. But that would not happen in the shining beacon of democracy would it? (conveniently forgetting a certain uni campus and some anti war protesters in the days gone by). Having said that, I think the inference that despite the armed resistance by the Korean shop owners, they sustained disproportionate damage thus armed resistance was futile is somewhat simplistic. My observation is that the Korean owned businesses sustained most damage purely because of their proximity to the neighbourhood where the riot was happing, underlying racial perceptions amongst the community (which TK has analysed previously), and the collective indifference by the mainstream society (that includes the government and media) which misrepresented the underlying cause of the riot (ie social and economic barrier by the black Americans) into a spontaneous outrage by the black American communities upon convenient and relatively powerless scapegoats. Back to the picture, I don’t think I can criticise the depicted individuals taking up arms to protect their livelihood where the state failed to do so. And maybe, the above mentioned damage was limited to that level because of those struggles. sometimes i think this blog should be labeled "Ask a liberal Korean"
however i acknowledge that you have stated from the beginning your particular background and political bias. as another korean, i feel like i learned a different lesson for the LA Riots and the more recent disturbances in New Orleans, Paris, Athens and Britain. where do the police go when a riot breaks out? they go home an protect their families. in worsening economic times, i believe that rioting in America will happen. i would hope that this time around either Koreans have since moved their businesses from the more dangerous parts of Los Angeles or have armed themselves accordingly. "inspiring" is not exactly the right word for me, but I know what you mean. I find the picture to be desperate. It's a simple point. Gun advocates argue that if everyone was armed in London, looting damage would have been significantly less, and present OP's picture as an example. And the point of the passage in the OP you quoted is that having guns did not prevent Korean Americans from suffering a hugely disproportionate share of the riot's damage. > It's a simple point. Gun advocates argue that if everyone was armed in London, looting damage would have been significantly less, and present OP's picture as an example. And the point of the passage in the OP you quoted is that having guns did not prevent Korean Americans from suffering a hugely disproportionate share of the riot's damage. There's nothing simple about it. There's no argument presented to show that the LA damage was towards the *high* end of what was possible and the London damage was toward the *low* end of what was possible, and the key causal difference was gun control. There's no argument presented to show that the LA damage was towards the *high* end of what was possible and the London damage was toward the *low* end of what was possible, and the key causal difference was gun control. There is. And given your tendency to be deliberately obtuse about conclusions of social studies with which you disagree, I don't particularly feel like giving any further exposition. The OP says everything I want to say on this topic. HAHA...You described me I'm anti dog meat and fan death denier...I believe some gun control is valid. But it can be cumbersome in a lot of cases! Most guns used in crimes are from the black market so if you REALLY restrict guns like banning them. Law bidding citizens like myself is at a serious disadvantage when it comes to protecting myself from these loser criminals! As far as law enforcement goes. As you seen from the LA riots they can't be everywhere at the same time...And how did the LA riots finally dissolved when the national guard came out with their heavy guns (although not loaded). So yes guns do protect property and lives! Michael R. The police did not abandon the area. The LA riots just turned into a free for all with everyone looting every stores in the neighborhood! The majority of the stores/retail establishment were Korean owned so yeah they were disproportionate affected. The police were simply overwhelmed and the fact that LAPD per capital is not a big force just compounded the problem! There were just too many people to round up. Did you by any chance happen to stumble upon this gem of an article? I was overcome with despair and shame for being from the great state of Texas when I read it but luckily I found your blog post and it brought me back from the edge. Thank you thank you thank you! Also, this is a fantastic blog! (first time reader here...) I have learned more about Korea in 30 minutes than I have in my 12 years of U.S. public school education... I guess that's not very surprising though. The gov't should fund a blog like this for every country on the planet... We could all do with a little more understanding. Disagree with one point LAW. In that the Law itself created many of the socioeconomic problems in the first place. Using the law to crack some skulls (like 4 years in prison for facebook posts). Merely creates more anger and more resentment, akin to papering over the cracks. > Because Asians are relative newcomers, African-Americans view themselves as the “indigenous” and “true” inhabitants of the inner cities, who are now being ripped off, condescended to, and economically displaced by exploitative “outsiders.” In 1990, a nine-month racial boycott against two Korean produce stores in Flatbush, Brooklyn, eventually drove both stores out of business. Led by the Reverend Al Sharpton, the boycotts fueled Asian-black tensions across the city. Two years later, during the Los Angeles riots that followed the jury acquittal of police officers charged with beating Rodney King, African-Americans burned or looted an estimated two hundred Korean grocery shops, smashing windows and attacking Korean shopowners with knives, guns, and crowbars. In the end, fifty-five people died (many of them African-American), another two thousand were injured, and property losses totaled roughly $1 billion. Epic fail by the NBC news editor, perhaps. Firstly, he's not got his facts right. There are police who carry guns in Britain. Not all police officers do, those who handle firearms are part of special units and the guns are deployed only when it's deemed necessary. Secondly, the timing and wider context of the editor's comment makes him seem even more ignorant. The riots started from peaceful protests at the SHOOTING of a young man BY THE POLICE. I'm a Londoner myself, but I'm living in Korea. I've had a couple of American friends who have made the same comment, however, that the people should be carrying guns or that the police should all be armed with them. Strange, I can't imagine why anyone would think it would be a good idea to give RIOTERS guns. How could anybody think that anything good would come from that? And as for the police using guns on the rioters - let's not forget that they were mostly young, probably largely disaffected people who were following the crowd and got caught up in it. The looting was just beyond ridiculous and the riots have very little to do with the shooting or the peaceful demonstration that followed, but regardless of that, can you imagine the political repercussions of the police opening fire on rioters for whom the trigger for their violence was the shooting by the police of a local young man? "The result is a low homicide rate: just 2 per 100,000 inhabitants in 2002, compared with 5.62 in America." Let's recognize that the US reports all gun deaths, including unsolved cases and justified homicides, while Britain only lists convictions. Appearances are everything, apparently in the UK. UK citizens have been directed to retreat if attacked and are not allowed to carry anything that could be used in self-defense. A citizen who successfully defends against an attack is then prosecuted to determine if too much force was used in their defense. After all, it's not fair to beat up a criminal. I guess it hurts their feelings and damages their sense of self-worth and entitlement to your property. In the US, we are much more inclined to defend ourselves and even our ground. Thus, there may be more conflicts from attacks, but we maintain more personal integrity and control over our lives than in the UK, where they have a welfare state and widespread dependency on the government. Sheeple are their main product over there. So, US citizens are less likely to be pushed around. There's nothing wrong with that. The world needs people who will stand up and resist evil. Retreating in the UK sends the message that the criminal is winning and encourages the attack or theft. Retreating here would be best when you need to reload. So when are you going to write a blog about racist tsunamis? You know, those racist tsunamis target and kill so many asians while leaving other ethnicities alone for the most part. Oh, you mean it has to do with proximity? Kind of like the proximity of Korean-owned property to the L.A. riots? Hmmm. Interesting. In another faulty comparison (murder rates in US vs UK/Korea), you fail to factor the unique US black male demographic (7.5% of the population responsible for 50%+ of murders..see FBI Unified Crime Report). Absent this subgroup, the US has a murder rate in line with Canada and the UK, even with all our guns. Now get this. The UK's violent crime rate is 500% greater than in the US. Even with the US's violent subgroup, home invasions/burglaries in the UK dwarf those in the US. Why is that? Why is that. I do have to congratulate you for breaking a long-standing stereotype...that asians are good at math.